This product is a rich source of proteins - the basic building blocks of muscle. It helps in maintaining healthy bones. It contains valuable to the health of amino acids. It is the perfect way to have a snack during the day or after exercise, without unnecessary carbs, sugar and excess fat. Recommended for people who train intensively, are active and want to have a lean and athletic body. To organic whey protein we have added organic raw cacao, which is a source of minerals and vitamins. Sweet taste adds a non-caloric, natural stevia. Milk obtained for the production of whey from cows grazing on organic slow meadows. 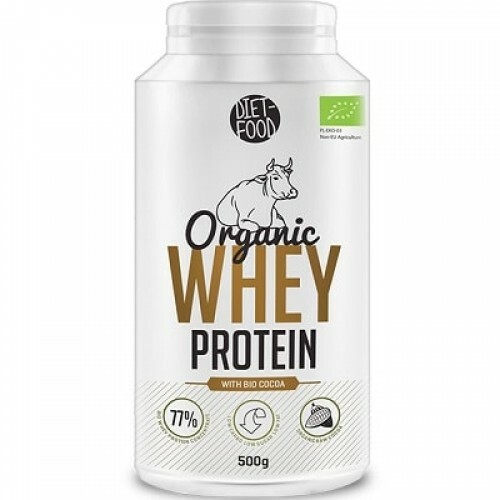 Organic whey protein (protein concentrate 77%) of organic milk, organic raw cacao, stevia.